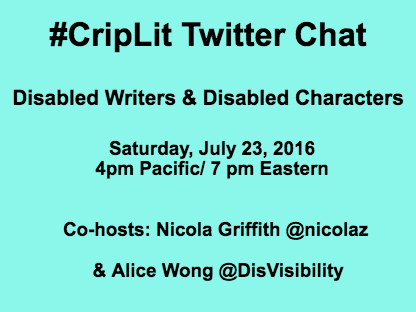 The first-ever #CripLit Twitter Chat, for and about writers with disabilities, is happening this Saturday: July 23, 4 pm Pacific/7 pm Eastern (midnight in the UK, 7 am Sunday in Perth and 9 am in Sydney—if you’re a night owl or early bird, do join us!). This first chat will be about fiction: writing characters with disabilities. Future chats will focus on different genres. Hopefully this will give you lots of time to think about your responses. If you’d rather just chat off the cuff (probably what I’ll end up doing because, well, life) just show up and let rip. There will no doubt be other questions and other avenues to explore in the moment. Anyway, when you respond to a question such as Q1, your tweet should follow this format: “A1 [your message] #CripLit”. Check out this explanation of how to participate in a chat by Ruti Regan. You might want to use a Twitter chat app like TweetChat but it’s not necessary. If you don’t use Twitter and want to follow along in real-time, check out the #CripLit live-stream. For a fuller explanation of who, what, why, when, and how, read my previous post, #CripLit Twitter Chat.